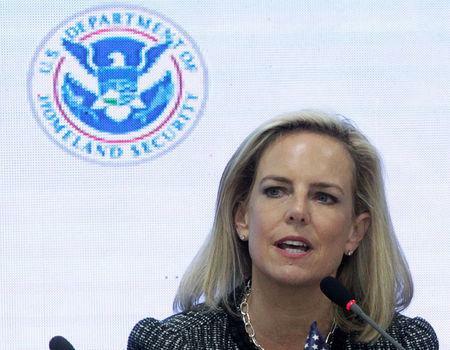 US Department of Homeland Security Secretary Kirstjen Nielsen is the latest staffer to quit under the Trump administration. Mr. Trump also announced he was tapping U.S. Customs and Border Protection (CBP) commissioner Kevin McAleenan to run DHS on an acting basis. US Department of Homeland Security Secretary Kirstjen Nielsen (left) speaks with Border Patrol agents near a newly fortified border wall structure in California. Nielsen travelled to the U.S. -Mexico border on Friday with Trump to participate in a roundtable with border officers and local law enforcement. The National Immigration Law Center, which has battled the administration's policies in court, said on Twitter Sunday: "Nielsen presided over a [DHS] that showed a blatant disregard for our Constitution, civil rights, and human life". That Nielsen herself is gone now is maybe of little solace to the families still waiting to see their children again, but at least somebody is now feeling defeated within that administration... we can only hope. It was unclear whether Nielsen resigned voluntarily or was asked to do so. CBS News first reported Nielsen's impending departure, which Mr. Trump announced after a 5 p.m. meeting with Nielsen at the White House. For many, Nielsen has been the public face of Trump's shameful immigration policies, including those created to separate children from their families at the southern border. Ms Nielsen, 46, has held the position since December 2017. He had previously threatened to close the US-Mexico border if Congress and Central American governments did not act to stem a flow of migrants that saw Nielsen last week order an "emergency surge" of personnel to handle the situation.